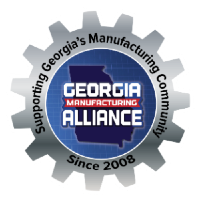 Leaders from the Georgia Manufacturing Alliance tour the KIA Motors Manufacturing Georgia factory in West Point Georgia. Mr. Randy Jackson Chief Administrative Officer shares the details of their success and "The KIA Way". The "KIA Way" got up-close and personal for the three tour groups from the Georgia Manufacturing Alliance. The guests were warmly greeted and fed well at the beautiful KIA Georgia Training Center where Chief Administrative Officer, Randy Jackson, spent over an hour sharing some history, strategies, and philosophy of Kia Motors Manufacturing Georgia, Inc. While their achievement of building KMMG in West Point, GA is impressive, their focus on the "heart and soul" of the operation sets them apart. The KIA team members are valued, safety and job security are paramount, and the Troup County community is flourishing.